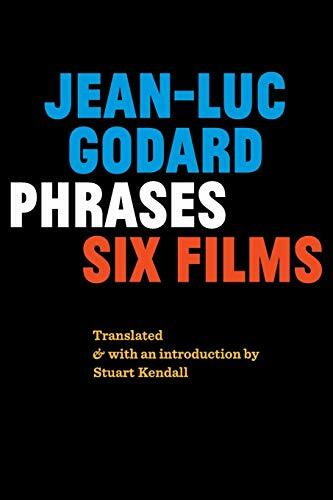 Phrases presents the spoken language from six films by Jean-Luc Godard: Germany Nine Zero, The Kids Play Russian, JLG / JLG, 2 x 50 Years of French Cinema, For Ever Mozart and In Praise of Love. Completed between 1991 and 2001, during what has been called Godard's "years of memory," these films and videos were made alongside and in the shadow of his major work from that time, his monumental Histoire(s) du cinema, complementing and extending its themes. Like Histoire(s), they offer meditations on, among other things, the tides of history, the fate of nations, the work of memory, the power of cinema, and, ultimately, the nature of love. Gathered here, in written form, they are words without images: not exactly screenplays, not exactly poetry, something else entirely. Godard himself described them enigmatically: "Not books. Rather recollections of films, without the photos or the uninteresting details... Only the spoken phrases. They offer a little prolongation. One even discovers things that aren't in the films in them, which is rather powerful for a recollection. These books aren't literature or cinema. Traces of a film..." In our era of ubiquitous streaming video, ebooks, and social media, these traces of cinema raise compelling questions for the future of media, cinematic, literary, and otherwise.